Transforming this experience into an even more romantic journey, Manohra Cruises presents a Sundowner Cruise of stylish indulgence. 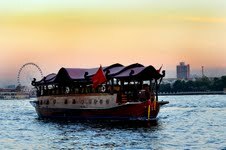 Guests step aboard a magnificently restored antique rice barge of old world elegance and modern comforts, and cruise serenely along Bangkok’s famous River of Kings at the most dreamy time of day. For this unique sundowner cocktail lounge experience, river guests relax on comfy low cushioned seats and chill out to ambient lounge music, as they watch river life unfold and admire impressive landmarks. Adding to the temptations, each person’s preference of Chang beer, house wine, sparkling wine and a seductive range of designer cocktails is accompanied by servings of gourmet canapés, for a taste of age old river life and refined Manohra luxury. The Sundowner Cruise is available every Friday from 20 September 2013 onwards from 5:30 pm - 7:30 pm, and is priced at just THB 999++ per person, including free flow drinks and canapés. Set out on a journey of romantic discovery with Manohra Cruises, from Anantara Bangkok Riverside Resort & Spa. For more information and reservations, please call 02 476 0022 Ext. 1416, e-mail riversidedining@anantara.com, or visit www.bangkokriverdining.com.